to develop in our students the qualities of dependability, responsibility, cooperation, honesty, and tolerance, the hallmarks of successful individuals. English 9 is a course with emphasis on grammar and usage, sentence structure and sentence types through traditional instruction as well as through extensive composition. The students also study literature through short stories and larger works of fiction and nonfiction. Poetry, speech, vocabulary, and library science are also covered. English 10 focuses on speech and interpersonal communications. The course also includes the study of literary terms and form and the critical analysis of literature through the study of short stories and novels. English grammar and usage is continued. Composition, poetry, and vocabulary are also studied. Prerequisite: Students will be considered for this course who maintain at least an 93% overall grade point average and are recommended by their 9th grade English instructor. Students with an overall grade point average of at least 88% will be considered with the recommendation of all four of the student’s academic instructors. In addition to the components of English 10, the course covers an expanded review of literature, focusing on world literature from early Greek to modern world literature. Short stories, essays, and novels are included. Development of advanced writing skills is also part of the course. English 11 focuses on contemporary literature and higher level composition skills. This is accomplished through the critical analysis of contemporary novels, short stories, poetry, and essays. Critical thinking through discussion and extensive writing is the foundation for the class. The class emphasizes American literature. Speech, and vocabulary are included in the course. English grammar and usage is on an as-needed basis. Prerequisite: Students will be considered for this course who maintain at least an 93% overall grade point average and are recommended by their 10th grade English instructor. 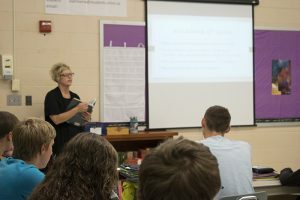 Students with an overall grade point average of at least 88% will be considered with the recommendation of all four of the student’s academic instructors. In addition to the components of English 11, the course includes a highly expanded review of literature, focusing on American Literature. The course demands extensive independent reading and study. A rigorous SAT based vocabulary program is utilized. Classroom discussions and student directed learning will be an integral component of the student’s assessment. This course is designed to offer a smooth transition between high school and post secondary education and/or the workforce. The first semester is focused on literature, with an emphasis on classic British literature, expository writing, and research writing. The second semester includes more on practical writing such as resumé, business and cover letters, job applications, and college essays. Vocabulary development is studied in both semesters. Prerequisite: Students will be considered for this course who maintain at least an 93% overall grade point average and are recommended by their 11th grade English instructor. 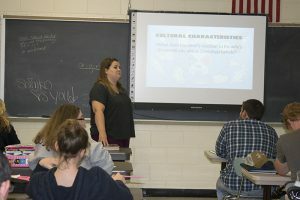 Students with an overall grade point average of at least 88% will be considered with the recommendation of all four of the student’s academic instructors. In addition to the components of English 12, this course includes an increased vocabulary challenge, an emphasis on higher level composition and literature skills, with a focus on college essays. Students will also be responsible for the design, development, and production of a student portfolio.